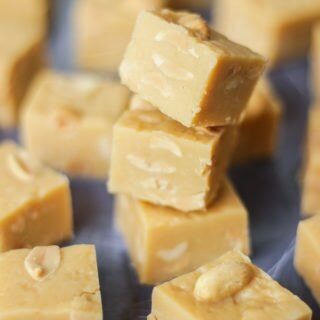 This really simple 4 ingredient Peanut Butter Fudge recipe is so quick and easy and totally delicious. It works every time and is made in just two minutes with condensed milk and chocolate. The perfect easy treat for peanut butter lovers. Put the condensed milk and chocolate into a large bowl. Microwave for 30 seconds at a time, stirring very well between each blast. This should only take 3 or 4 sessions of 30 seconds if you stir very well in between. Remove from the microwave and stir in the peanut butter. Beat until totally combined. Pour into a small dish lined with baking paper. Flatten down and sprinkle the peanuts on top, pressing in slightly. Refridgerate over night and the following day, cut into small pieces.